Popular in Himalayan regions, including northern India, Nepal, Tibet and China, momos are dumplings either deep-fried or steamed and filled with meat or vegetables. A traditional dumpling is filled with pork, vegetables and topped off with a spicy sambal sauce. Preparation is intense, as the dough is made by hand. After stuffing the dumpling full of tasty comestibles, the dough is then kneaded and prodded into a side braid that resembles a pastry-like turnover or Asian empanada. You can expect to wait half an hour for this snack or meal to arrive. But it’s certainly worth the wait. The texture and filling do not differ much by region. 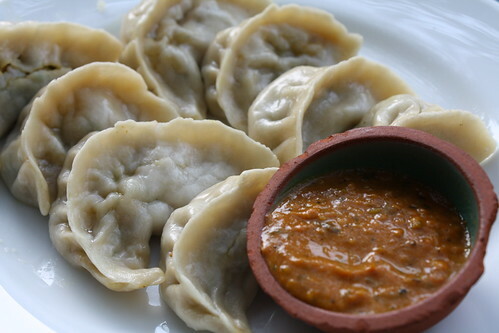 However, the sauce accompanying the momos tends to vary greatly by state. In some regions, a simple soy-based sauce is used while in others, like in Darjeeling or Nepal, the sauce is made from spicy chilies and be as thick as a curry. Those are some great looking momos. They aren’t always though–I got some once that were filled with canned tuna. Not a good combo. Daniel McBane´s last [type] ..Who Says Trekking in Nepal Has to Involve Lots of Walking?